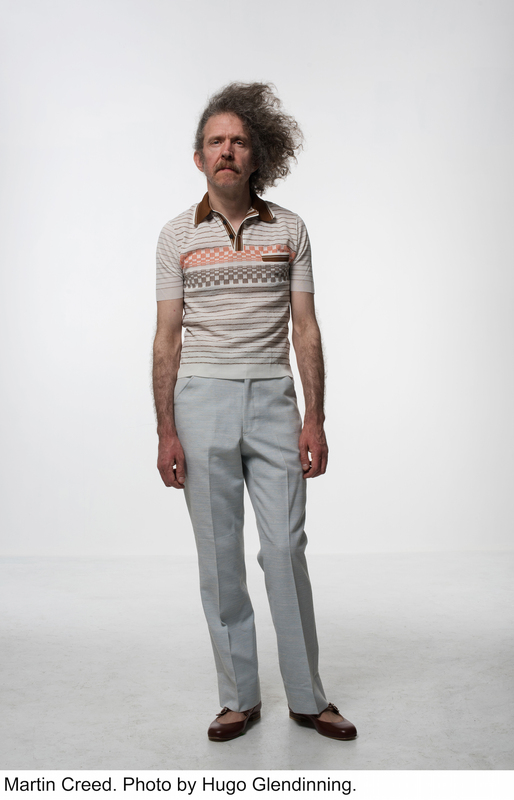 Curated by art world luminaries Tom Eccles and Hans Ulrich Obrist, “The Back Door” could be considered a mini-retrospective covering a twenty year career of artist and musician Martin Creed. Creed, who won the Turner Prize in 2001, is represented by Gavin Brown’s Enterprise in New York. Yet, as of late, if one was to search #martincreed on Instagram, most of the images that appear would be of people playing in rooms filled with balloons. An iteration from this particular series was recently on view at Gavin Brown’s Enterprise in December 2015. Titled “Work No. 2592” (2015) the ephemeral sculpture consists of a red balloons in a room, wall to wall, and nearly floor to ceiling. A similar version yet with white balloons, titled “Work No. 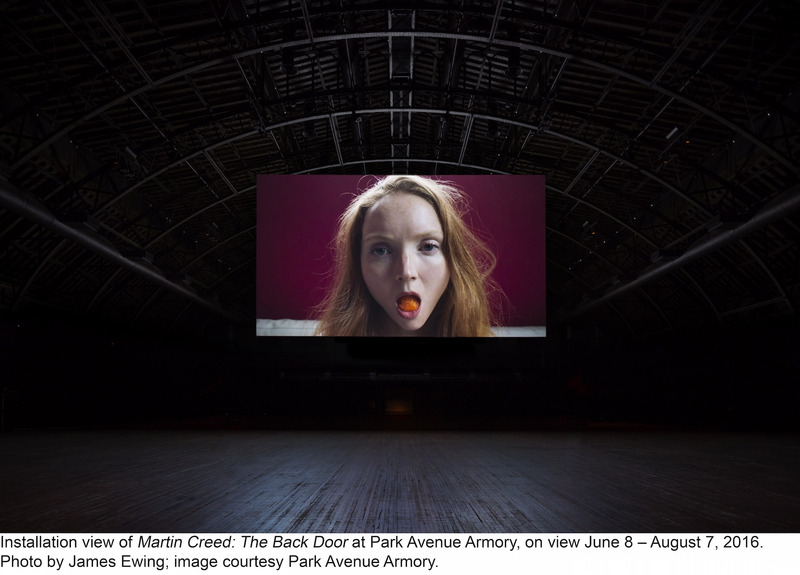 2497: Half the air is a given space” (2015) is on view as part of “The Back Door” the artist’s most recent exhibition at the Park Avenue Armory in New York. The balloons electrify visitor’s hair, make squeaky noises as they rub against flesh and fly into the air after being hit by flat palms, fingers spread wide, only to come back down. Materially relevant, they seem to be the most photogenic of Creed’s oeuvre. This is both good and bad for an artist. Work that has been photographed numerous times within the realm of social media is often more likely to bring visitors. However, as is the case with artwork or otherwise —judged by the screen of an iPhone— isn’t necessarily the artist’s best work or reflective of, in this instance, his career. When entering “The Back Door” visitors who have been perusing Instagram, may intend to find the Wade Thompson Drill Hall —the largest room of the Armory— full of white balloons, an enormous blanketed maze of rubbery fog. Instead, “Work No. 2497: Half the air is a given space” has been tucked into a smaller gallery, which upon entering, is on the visitor’s righthand side. In this realization an immediate response may be that of chagrin, however unlike what one might expect, this is in face only one element. Lurking beyond the entire first section of the Park Avenue Armory —reorganized to suit the eccentric sensibilities of Creed— is a toothsome installation that relies heavily on negative space. That’s right, the biggest interior is actually the least crowded. The artist has been known to make these unexpected spatial interventions such as “Work No. 160: The lights going on and off” (1996) which is on view in the Parlor (entrance just right of the Wade Thompson Drill Hall) and is what one might expect from the title, a light that goes on, illuminating the room and goes off, leaving everything in darkness. It is a physical change to the space, or rather the viewer’s ability to manipulate his or her body within the space, hence allowing for it, the light, to feel quite three-dimensional. In the main section, a series of six very short films, ranging from 1 minute 55 seconds to 2 minutes 48 seconds, play in a loop on a screen with a diameter suitable for a football stadium. Visible from both the front and the back, each film, titled for its subject, focuses on six different women, either sitting or standing quietly. The camera slowly pans, inching closer, to her face. Each minute detail is extraordinary and even in the expanse of the Park Avenue Armory, allows for an intimate experience due to the enlarged clarity. Within the non-verbal narrative of an interior within an interior, we are taken one step further as each segment ends when the heroine tentatively opens her mouth to reveal what could be food or a food-like substance. All of this occurs in relative silence and the effect is slow and eerie. Upon the conclusion of each short scene, the hall goes black and a shipping door slowly rolls open, the sound of cranking metal echoing throughout the expanse as daylight streams in. As if in a dream-like trance, those inside are lead to question if they are indeed looking outside on to the street or if it is an illusion of sorts. In fact, upon closer inspection, those present do get to look directly outside. In that instance, the busy sidewalks of New York became part of the exhibition, filled with characters one could never predict or dictate instructions to within the frame of their daily commute. Walking at a fairly quick pace, the diverse inhabitants of the city —yes, even in the Upper East Side— marched on with nary a look into the Park Avenue Armory or the door that had opened and was soon to close. Extremely poetic in nature, the installation, while billed as seven separate works, is really all that is needed in “The Back Door.” As we all know, ample space in New York is a hot commodity. That being said, when most have access to it their intention is to fill it up. On the contrary, entering the Wade Thompson Drill Hall was somehow a religious, almost church-like experience. Collectively, we are shown something —the women who slowly become both vulnerable and grotesque— and then shone light, streaming not from a projector but rather proof of day. Each video reveals subtle movement from the body and the camera (the body outside). The strangeness is undeniable, but it is also somehow both feminist and within the guise of the male gaze all at once. In every instance when shadows become dominant, moments of revealed light seem that much more intense, that much more striking. Light slices the air sharply, and the revelation of watching the public in real-time, without the filter of a computer screen, is both exciting and somewhat anxiety inducing as the ‘real’ world and the ‘art world’ collide. In the narrow rectangular space that runs parallel to the main hall, a series of older videos ranging from 2007 through 2015, show various degrees of human movement or action. The first is “Work No. 1701” (2013) shot with a fixed camera, consisting of physically challenged adults, crossing the street, accompanied by a dance music background. Each subject succeeds and once out of range of the camera, disappears. The films run in a loop and many are available on Vimeo. Rather then expand upon the show as a whole, this section seemed to detract from it, taking us out of the magical sense of space created in the other rooms and instead showing a lot of content in small confines. Understandably, doing this does gives visitors a comprehensive glimpse into the mind of the artist. This mind, at times, is as awkward as a teenager but also within a similar aesthetic vain as that of Mike Kelley, Jason Rhoades and even Tom Wesselmann. Creed’s work is both playful and biting, dirty and sweet. Even if entering “Martin Creed, The Back Door” through the front of the building, the exhibition is full of surprises and a must see. Go, even if your only intention is only to play with the balloons. 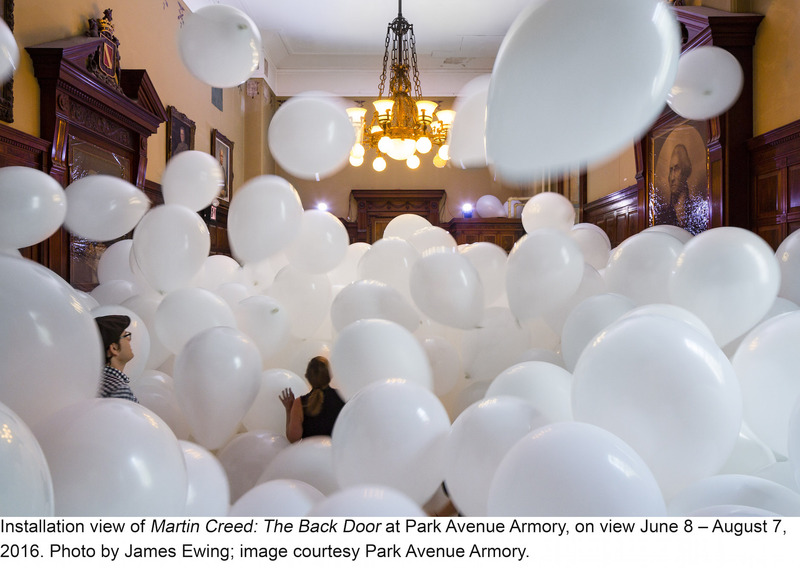 “Martin Creed, The Back Door” is on view at the Park Avenue Armory until August 7th, 2016.